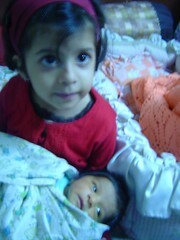 Our second daughter was born on 30th October. It was a Cesarean delivery and my wife took some time to recover, particularly from the anaesthesia’s side effects. So I was kinda busy and hence no blog post for almost a month. BTW if you have been resisting the temptation to buy a Reliance AirCard, like I had been for almost an year, I would say “Go for it”. I bought one before my wife was admitted to the hospital. I could remain in business even while I was at the hospital with my wife. The connectivity and the speed were good enough for me to get some work done, and not just check emails.